Driving a three-row SUV doesn't have to be a chore, because the 2017 Mazda CX-9 is engaging in every way imaginable. The sleek and dynamic exterior is the first indicator this isn't your average family vehicle. A truly refined interior with sophisticated designs continues the trend. And when you hit the road, it quickly becomes evident even the most routine trips are transformed into adventures. Four distinct models provide different levels of features, so you can select the Mazda CX-9 that's perfectly matched to your lifestyle. Each model uses the same Skyactiv-G 2.5 T four-cylinder engine. It works with a Dynamic Pressure Turbo, which eliminates lag and provides quick power at all RPMs. Peak output from this engine comes in at 250 horsepower and a thunderous 310 lb.-ft. of torque. Pressing on the accelerator is fun, and you have plenty of capability to climb hills or pass on the highway. Mated to the engine is a Skyactiv-Drive 6-speed automatic transmission. It provides smooth gear transitions, while a manual mode lets you take over. An i-Activ all-wheel drive is available, contributing greatly to the excellent handling you enjoy. It employs 27 sensors to monitor everything from the steering wheel angle to windshield wiper use and even the outside temperature. Combining these factors, it not only adapts to present conditions, but also predicts what the road ahead is like, so you can move forward with greater confidence. Complementing the all-wheel-drive system is a fully-independent suspension. Up front, a MacPherson strut combines with coil springs and a stabilizer bar for responsive steering. In the rear, a multi-link setup, stabilizer bar and coil springs combine comfort with crisp handling. The rack-and-pinion steering system features a variable power assist that detects engine RPMs, so you get the right amount of help in every situation. You'll have no worries transporting your family in the Mazda CX-9, because this SUV is loaded with safety innovations. For example, a power-assisted antilock four-wheel disc brake system is standard for all models. It works with electronic brake force distribution in emergency stops. Optional active safety systems monitor for dangerous conditions, and can even act automatically to avoid serious accidents. For example, the advanced blind spot monitoring system uses radar to detect vehicles hidden from view in the next lane. That same approach works with the rear cross traffic alert, so you always know if a vehicle is approaching as you reverse out of a driveway or parking spot. You can also get an adaptive front-lighting system. The headlights can pivot up to 15 degrees in whichever direction you turn the steering wheel. This innovation boosts visibility as you go through turns on dark roads at night, so you see hazards sooner and have more time to react. Transporting the family any distance often requires some excellent entertainment options. 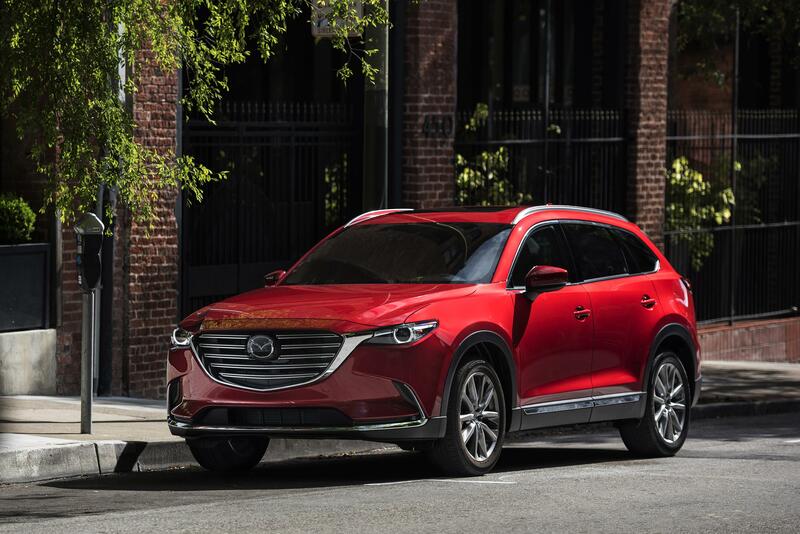 Thankfully, the Mazda CX-9 delivers with an easy-to-use Mazda Connect infotainment system. You can add a 12-speaker Bose premium sound system, with a custom design catering to the interior. As a result, you enjoy unrivaled clarity and range. SiriusXM satellite radio is also available, giving you access to commercial-free music, sports, comedy and more. Make an appointment or just come to our dealership to see the 2017 Mazda CX-9 in person.